The Earth has reached a tipping point. Runaway climate change, the sixth great extinction of planetary life, the acidification of the oceans—all point toward an era of unprecedented turbulence in humanity’s relationship within the web of life. But just what is that relationship, and how do we make sense of this extraordinary transition? Anthropocene or Capitalocene? offers answers to these questions from a dynamic group of leading critical scholars who challenge the conventional practice of dividing historical change and contemporary reality into “Nature” and “Society,” demonstrating the possibilities offered by a more nuanced and connective view of human environment-making, joined at every step with and within the biosphere. 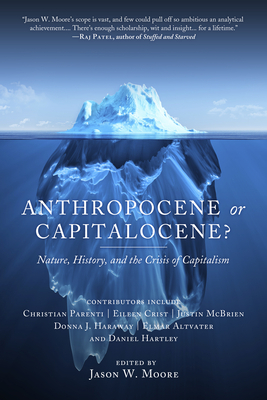 In distinct registers, the authors frame their discussions within a politics of hope that signal the possibilities for transcending capitalism, broadly understood as a “world-ecology” that joins nature, capital, and power as a historically evolving whole. Jason W. Moore is the author of Capitalism in the Web of Life: Ecology and the Accumulation of Capital. Elmar Altvater is the author of The Future of the Market: An Essay on the Regulation of Money and Nature after the Collapse of 'Actually Existing Socialism.' Eileen C. Crist is the author of Images of Animals: Anthropomorphism and Animal Mind. Daniel Hartley is the author of The Politics of Style: Marxist Poetics in and beyond Raymond Williams, Terry Eagleton and Fredric Jameson. Christian Parenti is the author of Tropic of Chaos: Climate Change and the New Geography of Violence.